Around this time each year we start to get graduation on the mind- our FaceBook news feeds are FULL of graduation pictures, everyone is decorating their caps and keeps talking about their future plans. As much as it scares us that we’ll be one of them soon, we wanted to dedicate a post to our friends who are graduating! This is the first year that graduation has hit us terribly hard. Many of these accomplished now-alums are our good friends. They’re only a year older than us and they’re already going on to bigger and better things! Kristen and I can hardly stand it- didn’t we just start freshman year like, yesterday? 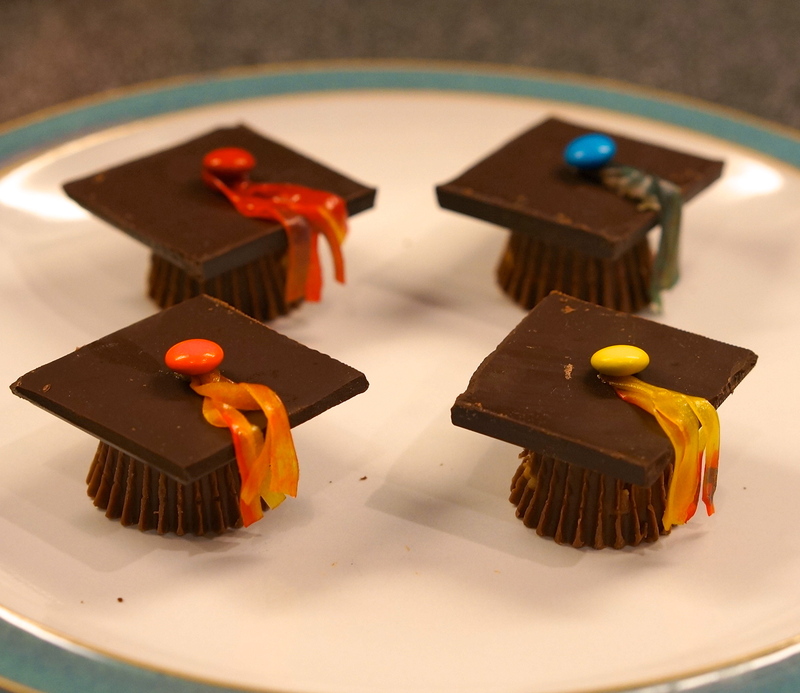 We are very proud of our friends who are graduating, so to celebrate we decided to try our hand at these homemade chocolate graduation cap desserts! These are a perfect treat to honor any graduate, plus they’re easy enough to put together while blubbering your eyes out (important if you’re anything like my mom at my sister’s college graduation). 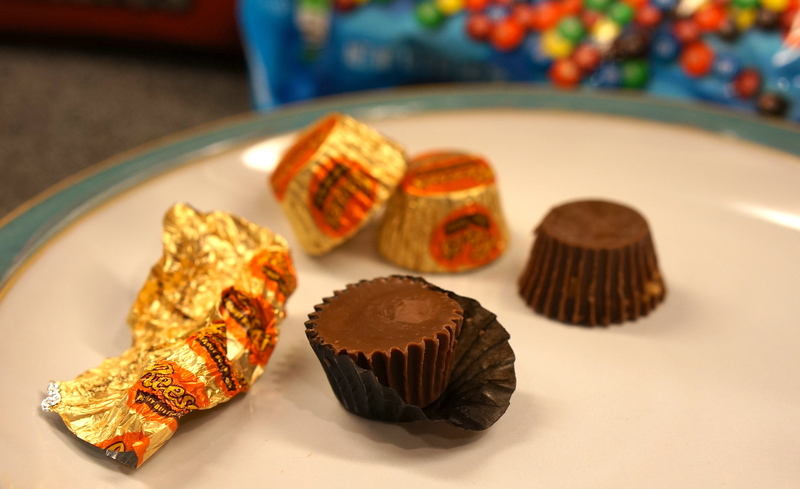 Unwrap the mini Reese’s candy completely and turn item upside down on a plate. 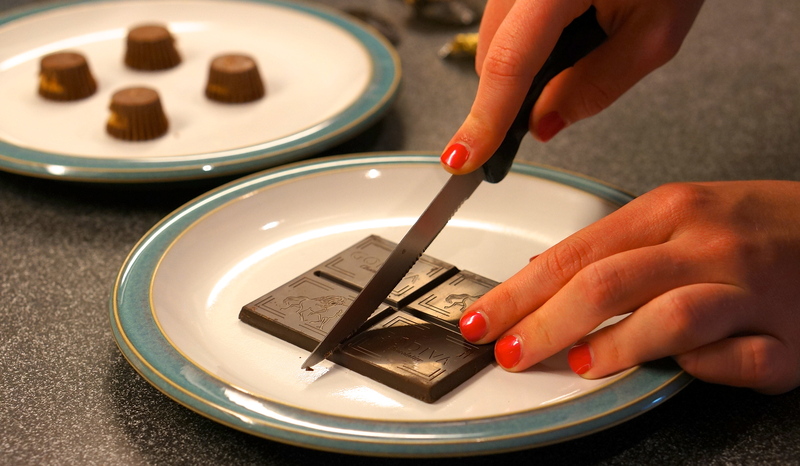 Cut the Godiva chocolate with the knife (breaking it with your hands will cause uneven edges). 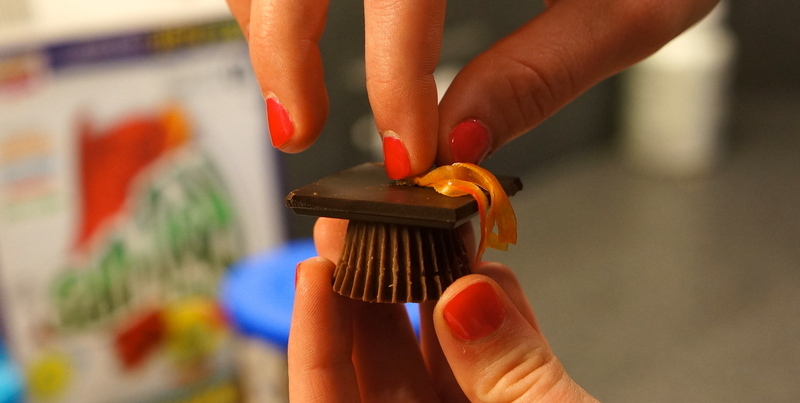 Then use a little bit of icing to “glue” it to the top of the upside down mini Reese’s cup. 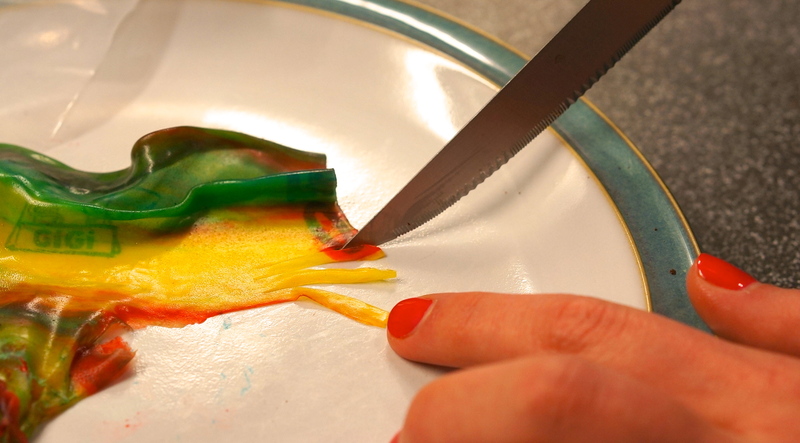 Put the fruit roll up in the freezer for at least 10 minutes so it is easier to handle. Once it’s done cooling, take it out of the freezer and place it on a plate. Cut the fruit roll up strips thin strips, about 1 inch long, to us as the graduation tassels. We tried to cut groups of strips that were the same color so we could coordinate our caps. Once you have four or five strips of the same color, use a dot of icing to attach the strips to the center of the cap like a tassel (the fruit roll up may even stick without the icing if it is sticky enough). 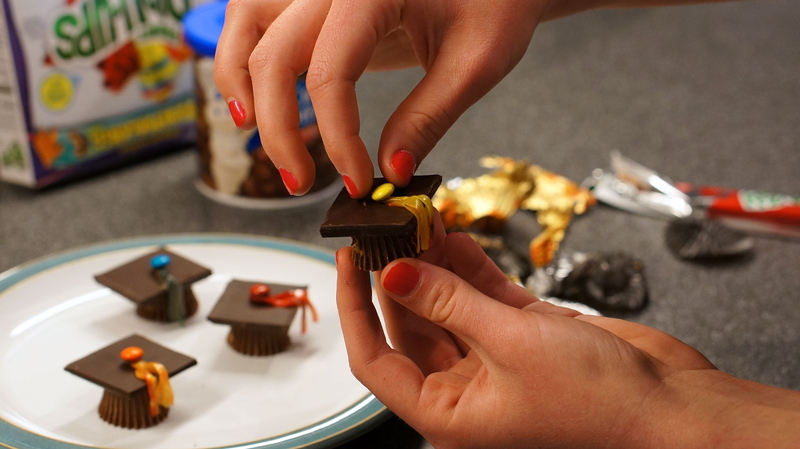 Using icing, attach a mini m&m on the spot that the tassel meets the cap. We used the same color m&m as the tassel. You’re all done! We love how these turned out- they were a really cute and simple way to make our graduating friends feel special. Plus, you can have them on their own or you can make them into your very own graduation cupcake toppers! 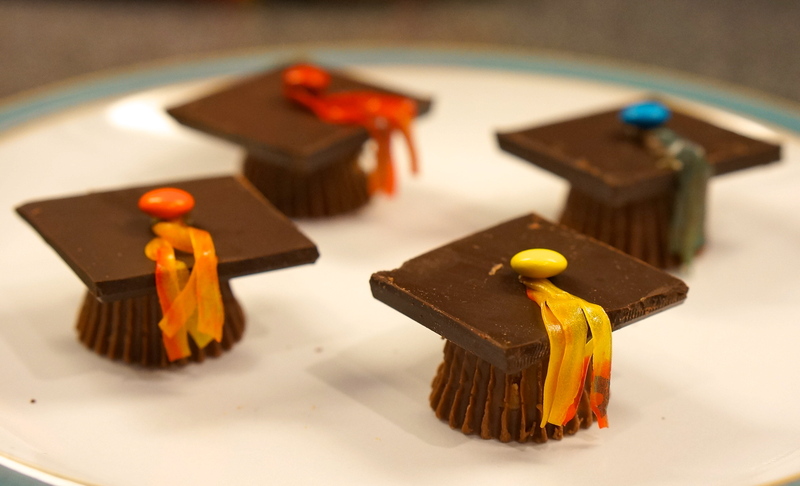 One of our followers took these adorable Reese’s graduation caps to a whole new level by creating this AMAZING cake! Thanks Andrea Zenner for sharing your awesome masterpiece! Share your attempts on our facebook page: https://www.facebook.com/WereCallingShenanigans. Be sure to check out some of our other shenanigans below!! OH those are adorable! I have an order to do a graduation cake for next week, I’m so using those as decorations! Thank you so much! Is there anything that we have to do? What a cute idea! So perfect for graduation parties! These hats are adorable! I have to find a reason to make them.